I know I already posted Clown Car, but this morning an image from my childhood popped up! When I was a small girl growing up in Huntington Beach (a.k.a. 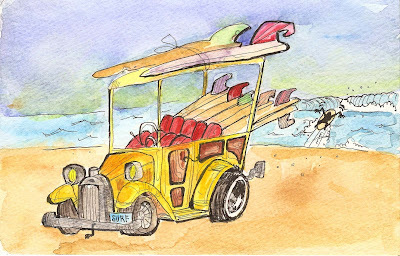 Surf City), the cool teenage boys on the street had a Woody Wagon loaded with their boards. An artist with Surfer Mag at the time was Rick Griffin who drew Murphy a comic surfer, so this is a Rick Griffin style wagon.